The rates shown on our Service Area Map are for typical platted subdivision lot Boundary Surveys. Rates will be determined based on the scope of services required and complete Builder packages are also available. 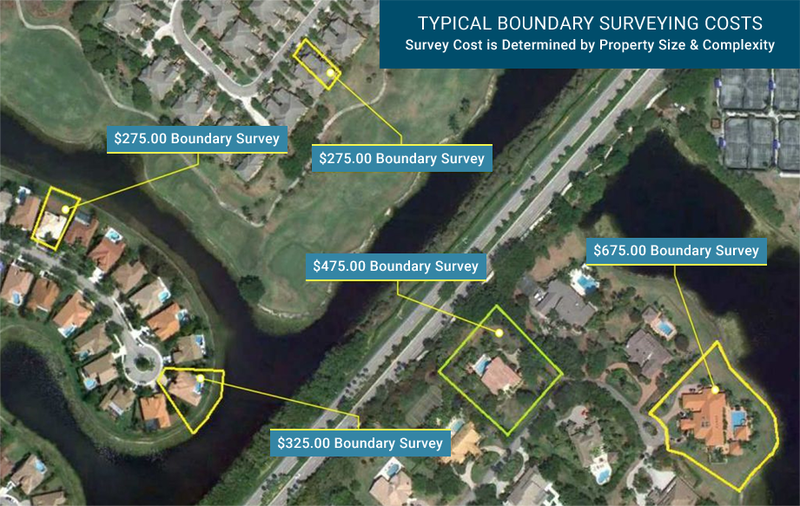 There are many factors used in determining rates when performing a Boundary Survey. The most common are Property Size, Complexity, Accessibility, and Difficulty. Property Size – Larger properties simply require more time to walk and measure in the field. Many larger properties are also typically described as being part of or “broken out” of a section (a one mile square portion of a Township). These properties need to be tied into the section corner monumentation in order to prove the legal description and this will further add to the time required to complete a survey. Complexity – The more permanent improvements that exist on a property will require more time to measure as well. Larger estate homes, multiple structures and complex property improvements will factor into the time necessary to measure these features. Additionally, these extra features will require more time for our CAD Technicians to draft. Accessibility - Heavily wooded or landscaped properties or properties with debris will likely interfere with the ability of a Survey Crew to efficiently access and recover property corners as well as measure the features of a property – adding time to complete the field work. Difficulty – A primary function of a Boundary Survey is to prove the legal description. This is ascertained by careful measurement of a property’s corner monuments together with control monuments (block corners, section corners, etc). If a Survey Crew experiences difficulties in recovering monuments (they’re not always there!) or if record data for the property is minimal or contains mathematical errors, this will certainly lead to more time required to complete the survey. As a matter of fact, no Land Surveyor can ever definitively know what to expect on any given project until they are actually on site – this makes for difficult fee estimates and in extreme cases, may require an adjustment to the estimate if problematic conditions are discovered. These are just several factors to remember when requesting a Land Surveying estimate and what makes it so much more important to choose your Land Surveyor based more so on their knowledge and experience than just their price.